For the third time in franchise history, the Seattle Storm have won the WNBA finals sweeping the Washington Mystics 3-0. The Storm capped off the series beating the Mystics 98-82 on Wednesday night. 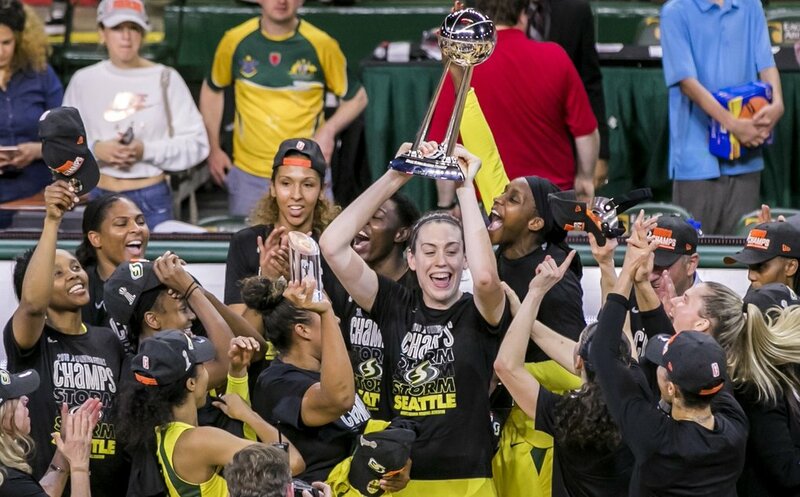 WNBA regular season MVP Breanna Stewart earned Finals MVP honors for the first time in her career, becoming the youngest Finals MVP in WNBA history at 24 years old and just the sixth player in league history to win both the regular season MVP and Finals MVP in the same year. According to an official press release from the WNBA, the Storm’s game-clinching Game Three of the 2018 WNBA Finals earned 0.4 metered-market rating. That makes the game the highest-rated WNBA Finals game on ESPN2 since 2010. The attention for the WNBA has shown growth over the course of the 2018 season. Attention arose either for positive reasons ranging from the rise of young talent in the league to star performances in the playoffs, and for negative reasons that revolve around issues with the league’s collective bargaining agreement negotiations that will be dealt with before the 2019 season. This championship marks another accolade in veteran Sue Bird’s long list of accomplishments in her career. Along with her third WNBA championship, Bird has won two NCAA titles at UConn, four Olympic gold medals, three world championship golds and four EuroLeague Championships. Her play throughout the 2018 WNBA playoffs shows that she is not anywhere close to slowing down and could play next season at the age of 38. It would not surprise any fan if Bird were to return to help the Storm repeat because of the youth that led the way alongside her. Stewart has emerged as one of the WNBA’s best young players. Jewell Loyd is a good compliment to Bird in the backcourt that can get hot and go on scoring spurts at any time. Natasha Howard and Alysha Clark are vital two-way players that make the Storm a threatening front court for many years to come. The Washington Mystics had no answers against the Seattle Storm front court, especially against Stewart and Howard. Mystics star player Elena Delle Donne performed well but not enough against the front court defense of the Storm that prevented nearly every entry pass the Mystics try to bring to the post. However, the Mystics have their own bright future ahead of them. Delle Donne is still only 29 years old, and she leads her own crop of young stars: Ariel Atkins, Natasha Cloud, Tiana Hawkins and Kristi Toliver. For Washington Mystics fans, the bright side of looking at this loss in the franchise’s first WNBA Finals appearance is that now these players have experience in this type of playing environment. Delle Donne’s knee injury in the semi-final round did limit her in the finals though she likely won’t make that an excuse as to why her team fell short. Questions will arise in the upcoming months surrounding the CBA negotiations. Will the players lockout the 2019 season? Will star players like Liz Cambage abandon the WNBA and solely focus on their career abroad where pay is better? That future is unknown, but the 2018 WNBA Finals shows that the future of the WNBA and women’s basketball will be a bright one.